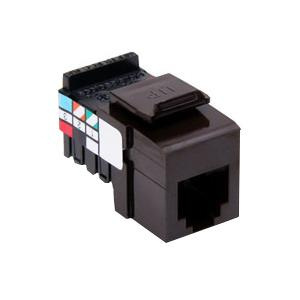 Leviton QuickPort® USOC and voice-grade connector in brown color, has solder-plated phosphor bronze contacts for better conductivity. Connector provides 110 type IDC termination. It measures 0.636-Inch x 0.885-Inch x 1.179-Inch. High-impact fire-retardant plastic body connector has 6-conductor UTP cable for reliable connection. Connector supports snap-in mounting for voice/data and video applications. Connector features robust one-piece lead-frame design for UTP applications. Voice-grade connector fits installed telecommunications wallplates, outlets and field configurable patch panels and patch blocks.